A tropical disturbance is in the ITCZ just east of the southern Windward Islands. A rotation is noted and there is some chance for development into a depression. The low is very far to the south and will move into South America / Trinidad and Tobago later today. There is little time before significant strengthening can occur. Heavy rain will accompany the low. 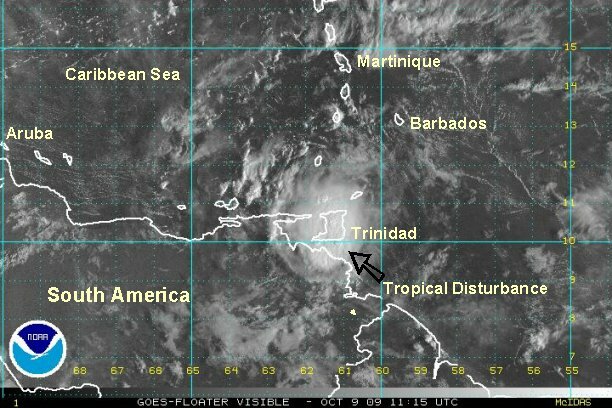 The center of the tropical disturbance is moving directly over Trinidad this morning. Winds of 20-25 mph have been common with rain. This was a very interesting system, resembling something that would have formed in the Pacific. It formed on the monsoon trough instead of from an easterly wave from Africa. This only very rarely happens in the Atlantic. 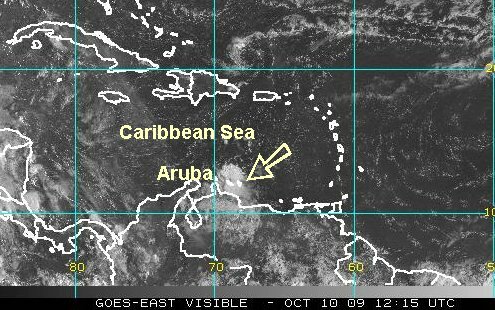 The tropical disturbance in the monsoon trough has progressed west near Aruba, Bonaire, and Curacao. It is bringing clouds with showers for a 3-6 hour period as it moves by. Due to its proximity to land, we are not expecting development. This is a rare feature in the ITCZ.